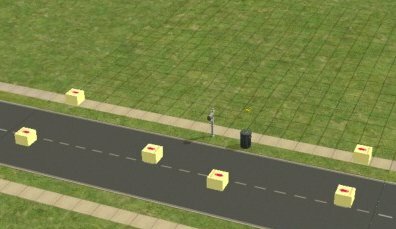 This is so that you can see and move various portals such as car and pedestrian portals. Also beach portals and various others. More invisible lot items can be added on request. So that it can work on a lot you are still building, that does not have sims living on it, the item will immediately reveal all objects it knows about when you buy it, and will hide them again when you sell it. 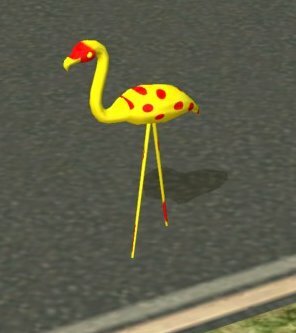 If you do have sims handy, then you can use them to operate the flamingo's menu and choose which objects to display. You will find the Portal Revealer flamingo in Build Mode, with the two-storey windows. I put it in build mode so it will be available on all types of lots without having to use categories the basegame didn't use. This is an optional group of small patches to make the portals buyable. They will then appear along with the flamingo in the double-height windows. This will probably not be required by most users. It gives placeholders to things like the "go here" destination which didn't have a model originally. Unless you know a good reason you need to see those, don't complicate your life by downloading the patch. Obviously without this patch, a few of the Revealer's options won't do anything. ijBuyablePortalPatches.zip updated 5th April 2008 to take account of fix by EA in FreeTime to stop waves and beach portals disappearing when a family moves out.